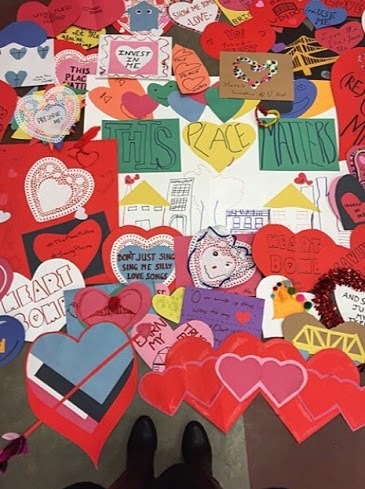 Young Preservationists show love for historic Pittsburgh buildings with "heart bombs"
Valentine’s Day usually involves displays of affection for another person: Your sweetie, your parents, your friends. 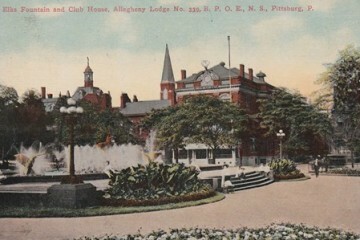 But the Young Preservationists Association of Pittsburgh is going to show their love and devotion to Pittsburgh’s history by “heart bombing” several historic buildings in the area this weekend. The YPA’s goal is to raise awareness about the plight of vacant or abandoned buildings that have historic significance, explains Katy Sawyer, board chair for the YPA. The group held a crafting day at TechShop in East Liberty earlier this month, where volunteers created Valentines inscribed with phrases such as “Love me, Don’t Leave Me,” “Invest in Me,” and “Let Me Be Yours.” The plan calls for the YPA to affix these Valentines to several structures over the weekend. The Heart Bomb Project was born in Buffalo, N.Y. back in 2012 when Buffalo’s Young Preservationists showed love for vacant and abandoned buildings in their city by covering them with handmade paper Valentines. The heart bomb project has since spread to other parts of the country including Cleveland, Philadelphia, Minnesota, New Orleans and Texas. This year will be the first heart bomb event in Pittsburgh. 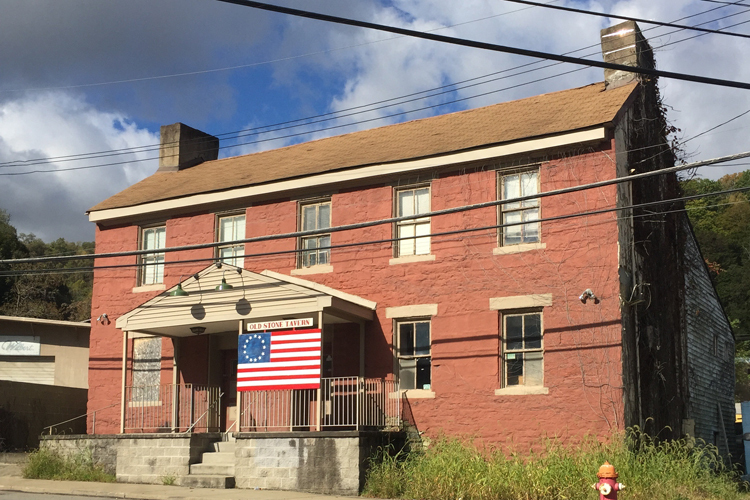 The YPA’s plan is to begin with the Old Stone Tavern in the West End, believed to be the oldest commercial building in Pittsburgh. It’s estimated that it was built in 1782, and served as a bar or restaurant through 2009 (except during Prohibition in the 1930s, when it was a “confectionary,” Sawyer says). Next up will be Drover’s Hotel, a Civil War-era building on Buena Vista Street in the Mexican War Streets neighborhood on the North Side. It began as a grocery store in the 1860s, and was a boarding house occupied by cattle drovers when that area of the city was mostly pasture. It’s on the National Register of Historic Places and sits in a City Historic District, but has been vacant and abandoned for several years. Drovers Hotel. 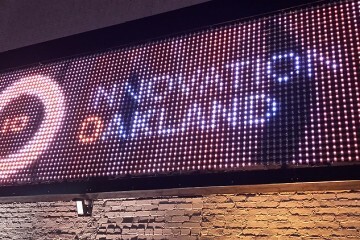 Photo by Erin Candee/Young Preservationists Association. 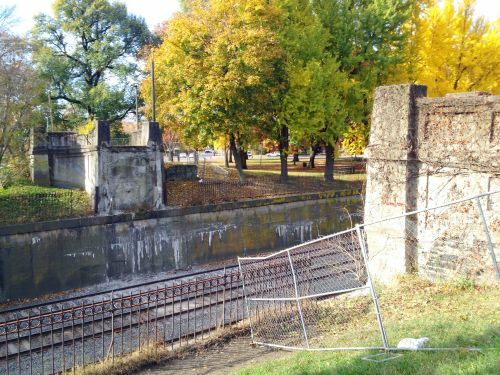 Saturday’s love fest will wind up at the Allegheny Commons Pedestrian Bridge, or rather its abutment columns, which are the only parts of it that remain. Built in 1906 to allow pedestrians to cross the train tracks to get from West Commons to Brighton Avenue, the dilapidated bridge’s arch and deck were demolished by the City of Pittsburgh in 2010. The plan was for the bridge to be at least partially restored, but it hasn’t happened so far. 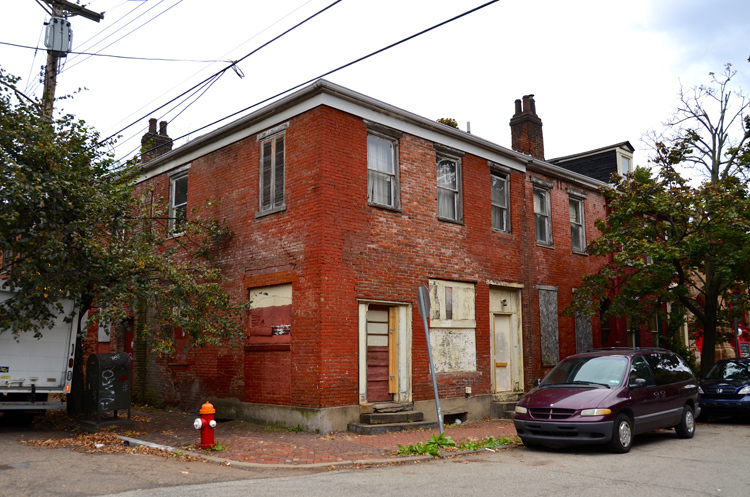 Then on Sunday, the YPA is partnering with the Student Conservation Association to bring a group of high school students to heart bomb locations throughout the Hill District, a tour which will include a bit of a history lesson as well, Sawyer says. For more information or to volunteer for the heart bombing events, visit the Young Preservationists website.